We bring to the attention of our readers this incisive overview of the US led “battle for oil” by Professor Eric Waddell. The article was first published more than ten years ago in November 2002, during the critical period leading up to the invasion of Iraq. What is ultimately at stake in Iraq is the intention on the part of the U.S. and its indefectible British ally to establish control over one of the world largest, cheapest and most easily accessible oil reserves. The war against Iraq is being fought on behalf of the Anglo-American oil giants: BP, Exxon-Mobil, Chevron-Texaco, Shell. The first objective is to secure the control by US-UK forces of Iraq’s oil facilities in the Persian Gulf. The US domestic consumption of oil exceeds 20 million barrels per day, 26% of total World consumption, an amount higher than the yearly consumption for all of Europe and all of Africa combined. U.S. oil imports constitute 56% of total consumption and are expected to reach 66% by 2020. The U.S. contains only 2.8% of total proven world oil reserves. Two-thirds of the world’s proven oil and natural gas reserves are in the Middle East (notably Saudi Arabia, the Gulf States, Iran and Iraq). Very substantial oil and natural gas reserves are located in the overlapping region of the Caspian Sea basin (Azerbaijan, Kazakhstan, Russia, Turkmenistan and Iran). Tentative estimates provided by the Energy Information Administration, place total (proven and possible) oil reserves at 243 billion barrels, or in excess of 25% of present global reserves),1 Iraq currently produces 11% of the world’s oil and it ranks only second to Saudi Arabia in the size of its reserves (112 billion barrels). Exploitation costs are less than half those of deep sea drilling. Direct access to the Persian Gulf and the Indian Ocean ensures strategically secure oil supply routes. The Anglo-American oil giants (BP, Chevron-Texaco, Shell, Exxon) are all absent from Iran and Iraq, which have signed oil contracts and production sharing agreements with French, Russian and Chinese oil companies. Because of the UN sanctions on Iraq, the agreements signed by Baghdad are not (“officially”) operational. 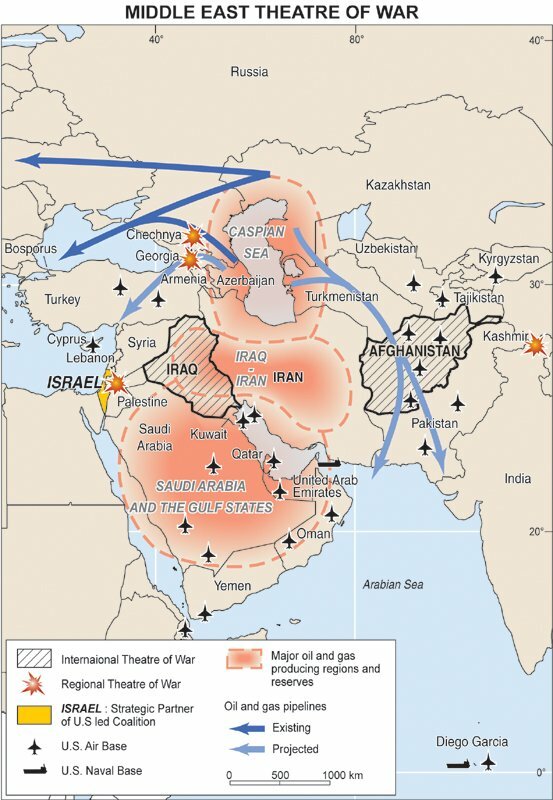 According to the Washington Post (15 September 2002): “A U.S.-led ouster of Iraqi President Saddam Hussein could open a bonanza for American oil companies long banished from Iraq, scuttling oil deals between Baghdad and Russia, France and other countries, and reshuffling world petroleum markets… A proposed $40 billion Iraqi-Russian economic agreement also reportedly includes opportunities for Russian companies to explore for oil in Iraq’s western desert. The French company Total Fina Elf has negotiated for rights to develop the huge Majnoon field, near the Iranian border, which may contain up to 30 billion barrels of oil.” Similarly the Franco-Belgian consortium Total-Fina-Elf, in partnership with Italy’s ENI, also has sizeable investments in Iran. Total had established, together with Russia’s Gazprom and Malaysia’s Petronas, a joint venture with the National Iranian Oil company (NIOC). Washington has on several occasions, attempted to break France’s deal with Tehran on the grounds that it openly contravened the Iran-Libya Sanctions Act. -The oil reserves of the U.S. are estimated at a meager 22 billion barrels. The broader region of the Middle East and the Caspian Sea Basin have oil reserves which are more than thirty times those of the U.S, representing more than 70% of the World’s total reserves. Control of this region by the Anglo-American oil giants means control over at least three quarters of the World’s supply of oil and natural gas. -It would also mean control over the Westbound, Eastbound and South bound oil and gas pipeline routes out of the region. – The U.S is responsible for 5850 million metric tons of greenhouse emissions, representing 20 percent of the World total.